from Astralwerks: The groundbreaking series Six Feet Under is widely heralded for its stunning marriage of song and cinema. Arguably the most poignant came in the show's final scene – the flash-forward montage featuring Sia's “Breathe Me.” Though hardly a newcomer to US audiences – her albums with Zero 7 sold over 400,000 copies - the impact of Six Feet Under made Sia a sensation. Literally overnight, sales of the soundtrack ‘Six Feet Under: Everything Ends' have exploded with immediate support from radio, video and publicity outlets continuing to pour in. 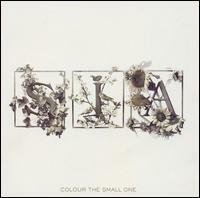 Now, Sia makes her proper US debut with “Colour The Small One.”A mesmerizing collection of heartfelt, deeply personal songs sure to appeal to fans of Tori Amos, Beth Orton and Sarah Maclachlan, the album captures Sia's many sides – at once soulful, somber and playful. American fans of Zero 7 and the HBO drama Six Feet Under already know Sia Furler , and many of them probably already own a copy of this, her second solo album, which has been available in the U.K. for two years but is just now finally getting a U.S. release. Sia is the voice of some of Zero 7's best-known slices of chillout soul, including "Destiny" and "Somersault," and it was her song "Breathe Me" that accompanied the famous "flash forward" montage that marked the conclusion of Six Feet Under. With a track record like that, it's hard not to approach Colour the Small One with high expectations. But despite some lush string arrangements and climactic moments like the undeniably stunning "Breathe Me," Sia's second solo outing remains a doggedly modest affair, marked by simple melodies and understated vocals from a singer who, with Zero 7, was often guilty of over-emoting. On the album's best moments, this low-key approach works beautifully; songs like "Butterflies" and "The Bully," which Sia co-wrote with Beck , are at once expansive and claustrophobic, rich with atmosphere but anchored by an almost folksy vibe and Sia's pretty yet conversational singing style. At other times, as on the sleepy "Don't Bring Me Down," Sia's soft purr gets lost in all those lush strings and programmed beats, and her simple melodies just float off into the ether.